OK, sorry about the sensational headline, I just couldn’t resist. Especially since there’s a grain of truth to it. I just came across case reports and papers reporting skin hyperpigmentation after minocycline treatment. These describe people who have developed blue/gray areas on their skin following minocycline treatment. Apparently this not so common but also not rare side-effect has been known since 1978. Here are two cases that developed around acne scars, apparently this sort of hyperpigmentation can develop even after fairly short treatments (more on that later). Here’s another case that developed for an older man who took minocycline for rheumatoid arthritis. 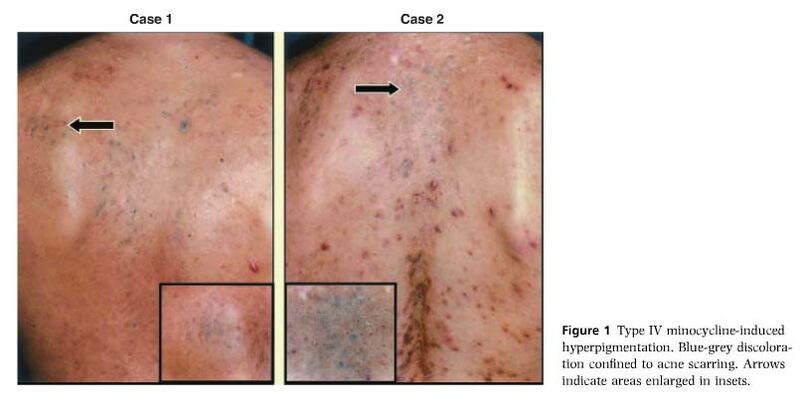 Source: Minocycline-induced hyperpigmentation: comparison of 3 Q-switched lasers to reverse its effects. As you can see from the image on the left, most of the face is covered with dark patches. The image on the right shows more normal looking skin, after laser treatment. In short, it’s not pretty. I’m not sure which one is worse, this or acne. The good news is that these side-effects are not that common. The bad news is that there’s no clear relationship between treatment dosage and duration and occurrence of hyperpigmentation. Based on the few studies available, this kind of hyperpigmentation occurs in 2.4 to 14.8% of patients on long-term minocycline treatments (3 months of more). The risk increases with dosage. Papers mention 100 mg/day or more as risk dosage. Unfortunately this fall right in the middle of common acne treatment dosages, which are 100 to 200 mg/day for treatment and 50 to 100 mg/day for maintenance. This happens far more often in patients on long-term treatments, usually 3 months or more. One paper noted that 50% of people who were treated for 3 years or more developed hyperpigmentation. The risk probably increases with age. Unprotected sun exposure may also increase your risk. All the reports deal with minocycline. I can’t say whether something like this can happen with other antibiotics. That said, some cases have been reported with treatments as short as 20 days. Apparently, hyperpigmentation around acne scars (see the first images) is more common after shorter treatments than hyperpigmentation that affects unscarred skin. This kind of discoloration isn’t limited to skin, it can also affect nails and nail bed, teeth, mouth, internal organs and even mother’s milk. In many cases discoloration fades over time, but this can take months or years. The first pictures were taken 43 months after the discoloration happened. Some papers also mention this is permanent. Fortunately, yet. I couldn’t find any studies on this, but there are several case reports of these being successfully treated with different laser treatments. I don’t want this post to sound like fear-mongering. I had never heard of this before, dermatologists had never mentioned this possibility to me. So when I came across these case reports, I wanted to tell you about it. This, I believe, is information you should have when considering antibiotic treatments for acne. Especially since most people believe antibiotics are more or less harmless. But these reports show that minocycline treatment for acne carries a small, but not insignificant, risk of staining your skin. In case you are thinking of antibiotic treatment, you should also see this post: Acne Antibiotics – Short Term Gain With Long Term Harm. Minocycline-induced hyperpigmentation: comparison of 3 Q-switched lasers to reverse its effects. Skin pigmentation due to minocycline treatment of facial dermatoses. Safety of long-term high-dose minocycline in the treatment of acne. 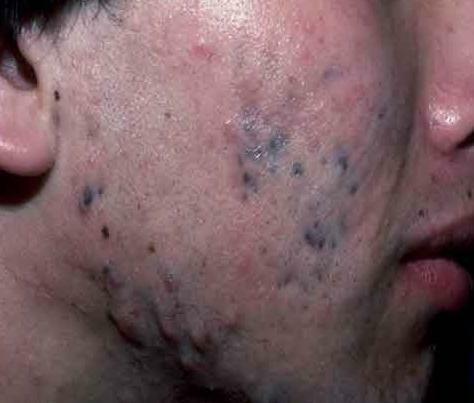 A new type of minocycline-induced cutaneous hyperpigmentation. Oral and systemic effects of prolonged minocycline therapy. This actually happened to me. I had what looked like a large bruise develop on my leg in college. It didn’t hurt, and I was worried it might be a symptom of something much more serious. While at an appointment to discuss my acne and treatment, I decided to ask the NP about it in case it were something I needed to get treated right away (not realizing there was a connection). She saw in my chart that I had been on minocyclene for several months, and assured me not to worry, that it was just from the antibiotics ant that it happens sometimes. Excuse me, but the possibility of my skin turning blue like a permanent bruise really should have been mentioned before starting treatment! Luckily, it faded over time, but it took years before it was completely gone. This is definitely a real issue, even if it happens to a fairly small percentage of folks. Dermatologists and other medical practitioners really should mention this potential side effect to their patients. Thanks for sharing, Lisa! Yes, I agree that this should be discussed. Imagine if you are unfortunate enough to have this on your face. I’m sure it’s much worse that acne itself! And this from a drug that offers no long-term relief from acne. what about post inflamatory hyperpigmentation? Is there anything that might help healing them faster or prevent them? Topical application of high doses of vitamin A (retinol, B3, C have been shown to work. I took Minocycline for 10 days, and on the 10th day I started to develop bluish pigmentation on my legs, arms and hands. Six weeks in, and they’re a little lighter. Will the pigmentation fade? Of so, how long will it take? Discoloration is not mentioned in drug side effects. My husband can no longer wear shorts in public both legs affected. Sad ….we enjoy the beach. I was on Minocycline for treatment of RA 100mg two times a day.I had to quit after the fifth day,my eyes turned yellow,my skin on my face turned purple with red blotches ,it still hurts every time i blink my eyes.I will see my Doctor tomorrow to see what can be done for my face rash,My joints also hurt and i have no energy ,i suppose this drug may help some people but i always seem to be the guy that finds the hair in my soup. This happened to my daughter along with several other autoimmune issues after taking minocycline for acne. It took a year to find a doctor who figured it out after seeing many who did not. One doctor said to me “So your daughter has a blue foot, so what? !” Really? So she’s not a Smurf that’s what. Plus it was only one of many more serious issues. From the research I’ve done it does seem rare, but definitely want to educate people what to look for so they don’t go through what we did. Look for the signs of sensitivity and do not ignore them regardless of whether or not your dermatologist has ever seen or heard of such thing it does exist. Well..I’ve been reading a lot of bitter reviews and side effects from this medicine. I have a light case of acne and I am just going to treat it with over the counter creams and washes. I’m not getting myself into another problem with my skin looking like a smuf. I’m tossing the pills away. Not even worth the risk. Starting minocycline approx. 25 years ago. Highly effective in treating moderate acne. Continued using as maintenance at a very low dose. Over the past several months, noticed blue-ish tinge to my inner ears, around my lips and my toes. Dermatologist advised me the cause is long term minocycline and that the hyper pigmentation is irrefusable. Long time minocine user for mild to moderate acne. Against my dr’s advice to stop taking once skin cleared (very effectively), I continued taking a very low dose as maintenance for many, many years. I have recently been diagnosed with GA on my legs, Grover’s on my torso, an undiagonsed intense rash on my neck and chest (all auto immune). My last apt with derm, I mentioned that I had noticed my inner ears, around my lips and the whites of my eyes were BLUE. She immediately knew all issues were due to long term use of minocine. I fear the blue discoloration will be permanent and I will as well have to suffer with acne.